As the second-largest city in Australia, Melbourne shows time and time again why it is one of Australia’s most travelled to destinations. With plenty of activities and attractions for families to explore, the options are almost endless of what you can get up to – even the locals are continually finding new things to do! With different things to do right across the city, Melbourne’s attractions cater for all the different ages from the young ones right through to the young adults – even the adults who are just wanting to feel young again too! Celebrating more than 100 years of fun, laughs and squeals, Luna Park Melbourne is one to add to the top of your to do list! Perfect for families, and even those without kids, Luna Park is overflowing with great rides and fantastic attractions making this one adventure you don’t want to miss out on! With rides for the more timid, right through to the thrill seekers after their next adrenalin rush, Luna Park is the ultimate day out! Step through the iconic smiling mouth, and get ready for a wild adventure you’ll never want to end! Overlooking Port Phillip Bay in St Kilda, Luna Park is easily accessible and can be reached by car, train, tram or bus making it perfect for whatever your travel situation may be! With parking on site for roughly $11.00 a day, and public transport options for a similar price, getting to Luna Park is both simple and affordable! Luna Park Melbourne is home to a number of iconic rides, but also an array of new ones to keep you and your children on the edge of your seats! Most famous for the Great Scenic Railway roller coaster that travels throughout the whole park, this is the world’s oldest continually operating roller coaster after opening in 1912! With so many other fabulous rides including the Twin Dragon swinging ship and the Sky Rider Ferris wheel, no matter your fear tolerance or height, there is sure to be an attraction here that you and your children be able to enjoy! When travelling to Melbourne with children, a visit to Luna Park cannot be missed! Take advantage of the family ticket packages, for an even more affordable day or night out! Melbourne’s great aquarium consistently receives strong reviews on holiday reference sites, and with good reason! Situated in an easily accessible location in central Melbourne, SEA LIFE aquarium has a dazzling array of aquatic animals from all corners of the globe. With plenty of opportunities to get up close and personal with many of the animals, children can touch and feel the creatures making this adventure that much more surreal. With a reasonable entry price, and family passes available that offer further savings, Melbourne Aquarium is really an attraction to add to the top of your list. One of the definite must sees when travelling to this fabulous city, this aquarium is a great place for both the kids and the kids-at-heart. Melbourne Aquarium offers several hours’ worth of entertainment (depending on the attention span of your kids!) with thousands of different species of tropical, cold, fresh and saltwater marine creatures that range from the Atlantic to the Antarctic! Watch as the sharks swim above and around you, or check out one of the Aquarium’s major highlights – the colony of charismatically cute sub-Antarctic penguins. Kids typically love the funny antics of these cute creatures and the well-maintained exhibits provide unobstructed views of their habitats! Another popular exhibit for the kids is the glowing jellyfish room, as the special illumination makes not only the jellyfish glow with vibrant colours but clothes also! With multiple levels and underwater themed tanks and enclosures, you and the kids will come across coral reefs, freshwater rivers, sharks, rays, turtles and much more. Lastly, don’t forget to check out the touch pool, where kids will be able to get their hands on some of these weird and wonderful aquatic creatures. A day out at SEA LIFE Melbourne Aquarium will not just be fun for the kids – they may even learn something while they’re there! Immerse yourself in a world of LEGO at the LEGOLAND Discovery Centre in Melbourne’s Chadstone Shopping Centre. This child friendly attraction is designed exclusively for children and only adults with children in tow can visit LEGOLAND to explore the exciting LEGO themed rides, replica LEGO builds of landmarks and play area where children can let their imagination run free. Step inside this indoor playground where children aged 3-10 years can come along and play, create and build in a safe environment. See a replica LEGO version of Melbourne at MINILAND and join in on the fun with your kids building tall towers and wonderful and colourful creations. "Step inside this indoor playground where children aged 3-10 years can come along and play, create and build in a safe environment." Visitors can even join a behind the scenes tour to discover how the LEGO is made or learn how to create and build models with a Lego Master Builder. There is even a 4D Cinema that will take you and your little ones on an exciting adventure with simulated rain, wind and snow. It is recommended that you allow at least three hours to explore all the activities within centre. LEGOLAND Discovery Centre is open from 9.30am to 5.30pm with extended hours during the school holidays. For an experience all about interacting with nature, you can’t look past Collingwood Children’s Farm. The perfect attraction for any families visiting Melbourne, this park introduces children to all things farm animals – including how to feed them, how to care for them, and even how to milk them! Only 5km from the centre of Melbourne city, Collingwood Children’s Farm is located on the bend of the Yarra River. Set upon seven hectares of paddocks, gardens and rustic buildings, Collingwood Children’s Farm can be reached by car, public transport, bike or even foot! Choose the active option, and follow the Capital City cycling and walking path which takes you directly to the site from Victoria Park Train Station or hop on one of the buses from the same station and you’ll be dropped just after the Collingwood Children’s Farm. Whilst the location is easily accessible by car, parking can quickly add up which is why the alternative transport options are our favoured choices! A visit to the Collingwood Children’s Farm will see you and your kids interacting with farm animals such as the famous Ayrshire Cow named Heather, the resident donkeys, goats and so many other gorgeous creatures! Don’t forget to take advantage of the daily cow milking shows at 10am and 4pm, where everyone is welcome to have a try! With a delicious café on site well known for its great food and atmosphere, close proximity to the city and plenty of animals to befriend, Collingwood Children’s Farm is perfect for a great day out – and one the whole family will adore! Home to more than 320 different wildlife species from across the world, Melbourne Zoo is bound to be a guaranteed hit with children of all ages! From the cute Asian Elephants and Southern Hairy-nosed Wombats through to the more terrifying Philippines Crocodiles and Sumatran Tigers, there is so much to see we can promise, that your kids will be entertained for hours! Explore the Zoo and be mesmerised by the array of different attractions and exhibits you won’t want to miss! Let them experience what it’s like to work at a zoo in the Keeper Kids playspace, explore the interactive Growing Wild exhibit and watch as they patrol for danger alongside the Meerkats, burrow through tunnels and climb inside Giant Tortoise shells, or immerse themselves in the magical Butterfly House, home to hundreds of vibrant coloured native butterflies as they effortlessly land upon their shoulders, head and arms. Melbourne Zoo is located only minutes from the city centre in Parkville and is easily accessible by both public transport and car – best of all, parking is only $2 for 5 hours! If driving isn’t an option for you, catch tram 55 and get dropped directly outside Melbourne Zoo, or catch the train from Flinders Street Station on the Upfield line and stop at Melbourne Zoo’s very own Royal Park Station. If you’re after not only a fun and exciting day out, but also one that offers an educational experience, you can’t look past Melbourne Zoo. From the moment you step foot inside the gates, you and your children will be enthralled by all the wonderful animals that call this great attraction home! Even better, visit on the weekend and children under 15 receive entry for free! An outstanding venue with displays dedicated to all aspects of natural history, the Melbourne Museum is annually ranked among the top 10 attractions. Whilst the first word that comes to mind when imagining a museum may not always be fun, Melbourne Museum breaks that stereotype and gives kids plenty of chances to get hands-on and play, with an emphasis on involvement and engagement rather than simply bombarding them with information. With an amazing convoy of exhibits that are ever changing, no two visits to the Melbourne Museum are ever quite alike. Be sure to leave enough time when planning a visit to the museum, as the wide array of exhibits are typically enough to cover half a day. During your time, you’ll encounter a range of sections divided up into individual galleries, including the Science & Life gallery, the Forest gallery, the Children’s gallery (with a series of exhibits aimed at kids between the ages of 3 to 8 years old), a Melbourne gallery dedicated to exploring the city’s history in entertaining detail, and many more! 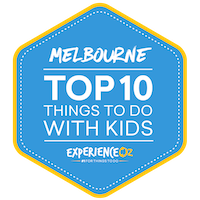 If you’re looking for an attraction to spend time in Melbourne with kids that provides a nice combination of entertainment, education and reasonable pricing, the Melbourne Museum is a more-than-solid choice. Let you and your children experience an African Adventure without leaving the comfort of Melbourne! At Werribee Open Range Zoo, this is what you’ll experience as you immerse yourself in an environment shared with Cheetahs, Gorillas, Hippopotamuses and so much more! Situated just 35 kilometres from the centre of Melbourne city, Werribee Open Range Zoo located on the Princes Highway adjacent to Werribee River, is just a small drive by car, shuttle or public transport. By car, the thirty-minute journey is easily manageable; likewise, the shuttle and public transport option are also convenient! If travelling from Melbourne, the Werribee line from the CBD will take you to Werribee station, where a bus to the zoo is accessible. Alternatively, several shuttle bus and tour buses can help make your journey to Werribee Open Range Zoo possible! "Let you and your children experience an African Adventure without leaving the comfort of Melbourne!" There are so many things to see and do over the 200-hectare property, that we can guarantee your children will not get bored! Take a ride on the free Safari tour and keep an eye out for some of the majestic animals that roam these parklands, or sit back and enjoy one of the presentations as you watch the talented keepers feed and interact with the animals. These options are just two of the many great things Werribee Open Range Zoo has to offer. If you’re after something a little more hands on, take advantage of the Wild Encounters that allow you to get up close and personal with the animals. Choose from packages such as a Giraffe Feed Encounter or an African Cat Encounter and so much more for a small extra cost! 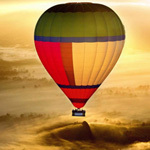 Imagine an interactive adventure, learning about all things science and technology in a fun and enjoyable environment. At Scienceworks, this is exactly what your kids will experience! A visit to this fantastic Melbourne attraction will keep curious minds entertained whilst introducing them to new and exciting ways science is changing every day life! Located just 5 minutes from Melbourne CBD in Spotswood, Scienceworks is easily accessible by both public transport and car, with an onsite parking lot available to visitors at a meager $3 per day. If arriving via public transport, Scienceworks is a small 10 minute walk from Spotswood train station, or accessible by the Williamstown Ferry! Your children will fall in love with the ever-changing exhibitions that explore topics such as space, the human body, and transport. In this hands-on environment, Scienceworks incorporates many different machines and displays that encourage children to get their bodies moving. Perfect for young children or teenagers, there will be some form of exhibit that will not only entertain their minds, but also educate their brains! Don’t forget to check out the optional extras for a small-added price. You and your children can visit the Planetarium show and learn all things space, or view the Lightning Room Show that teaches all things electricity! Give the kids a taste of riding a real life Thomas the Tank Engine with a ride aboard the authentic Puffing Billy steam train that runs through the beautiful Blue Dandenong Ranges of Victoria. This famous narrow-gauge railway winds its way through the mountainside and offers some great views of not only the surrounding forests but also the many different types of wildlife that can be found in the trees. The Dandenongs can be reached by a roughly one-hour drive outside Melbourne itself and offer a great bonding experience for the family. With the engine drivers being very accommodating towards children, they may even get the chance to blow the train’s whistle! With both open and closed carriages to choose from, you can sit in whichever you feel most comfortable with as many kids enjoy dangling their legs outside the carriage as they soak in the pleasant atmosphere of times from the past. Both the engines and carriages have been lovingly maintained over the years and the dedication to the trains themselves is obvious from the enthusiasm shown by all the staff members involved in the Puffing Billy experience. Listen to the informative and entertaining commentary throughout the journey and take in all there is to know about this fantastic area. If you’re planning to invest a full day, you may want to bring along a picnic and stop off at one of the great, green hillside locations along the way before catching the train again for the ride back. Lastly, a couple of tips for the ride: arrive around 30 minutes prior to the train departure time (or earlier on public and/or school holidays) if you wish to get a decent seat as it can fill up quickly. Also try to avoid either you or your kids wearing white clothing as it can become easily stained from stray ash and soot emitted from the engine up front! If your children appreciate wildlife, then there are few better places to get a more “natural” experience in the greater Melbourne area than the nature parks on Victoria’s Phillip Island. While it requires a fair amount of driving to access from the city centre, (roughly 90 minutes from the CBD) it is well worth the trek! The island plays the role of a sort of “wildlife wonderland” and acts as a fitting escape from the hustle and bustle of the city’s more urban attractions. The island has become particularly famous for one unique reason – the nightly “penguin parade” conducted by its colony of tiny, cute Little Penguins. Your kids will no doubt enjoy watching these cuddly creatures making their journey along the beach to their roosts! Take it in from one of the general stands or boardwalks that are set up specifically to provide the best possible spot to watch it all take place. The penguins aren’t the only wildlife attraction on the island however; there are also chances to see koalas up close from the elevated treetop boardwalks at the Koala Conservation Centre! The southern hemisphere’s largest colony of fur seals can also be found basking on the rocks of the area known as the “Nobbies”. Add to this range of sights with plenty of opportunities for bird watching, swimming and scenic walks, and it’s easy to see why Victoria’s Phillip Island is a wildlife and nature wonderland! Phillip Island serves as a great location for a day trip when in Melbourne – not just for animal lovers, but also for everyone. Wonderland Junior is a child friendly theme park located in Melbourne’s inner city Docklands precinct and is filled with rides and attractions for the whole family to enjoy. The fun park has a bundle of rides and games for all ages including popular family favourites like The Carousel, The Circus Train, The Tea Cups, Mini Swing Rides, Dodgem Cars, Pirate Rides and a dinosaur themed inflatable Jurassic Adventure. There are also a series of games and prizes to be won at Wonderland Junior Sideshow Alley. Play the laughing clowns, Busta Balloon and the ever popular lucky numbers to try your luck and win a toy. Unlike other fun parks, Wonderland Junior does not charge an entry fee and visitors need only pay for the rides or games that you choose to play on thus saving your hip pocket. "Wonderland Junior is a family fun park in Docklands with all your favourite child friendly rides including a Carousel, Circus Train, Tea Cups, Swing Rides, Dodgem Cars and Sideshow Alley games." Each ride or attraction accepts 2-3 tokens per ride so users can purchase a 10 pack of tokens for approximately $25 and ride on a couple or rides. If you and the kids plan on spending the whole day here though, then we recommend the unlimited ride wristbands which will give you access to any ride as many times as you wish starting from $29.50 per person. Wonderland Junior is a budget friendly day out within the Docklands precinct and come alive at certain times throughout the year when holiday themed events are held. Visit in Easter or in Christmas to find family entertainment, activities and even appearances from Santa. Wonderland Junior is open all year round on weekends, public holidays and every day during the school holidays from 11am to 5pm. A city of culture, coffee, colour and contrasts, Melbourne is widely regarded as one of the best all-around cities not only in Australia but on the global stage. It's a city that can be enjoyed over the course of both short and long stays, although prioritising what you're looking to do in such a diverse city can often be a difficult task. As a frequent contender for the title of "World's Most Liveable City", it's an urban metropolis that still retains something of a small-town feel, with an emphasis on the artistic, quality dining and plenty of historic architecture to explore. In this article, we break down what are the top 10 "Must-Do" experiences and sights to visit while in Melbourne to help you get the most out of your visit to this diverse and lively capital city. We attempt to cover attractions and sights catering for a broad range of tastes, however, regardless of your interests, all of these items are worth a visit during your time in Victoria's capital. Victoria’s largest war memorial and perhaps Melbourne’s most recognised landmark, the Shrine of Remembrance stands as a lasting tribute to our country’s fallen soldiers and various other servicemen who sacrificed their lives during the First and Second World Wars to help ensure our freedom. Holding over 120 ceremonies and commemorative services throughout the year, the Shrine is also one of the most active venues for paying tribute to our heroes and is also situated in a great vantage point that offers beautiful views of Melbourne city itself as well as the bay area, it makes for a must-visit while in the city for both historical and scenic purposes. An appropriately solemn atmosphere surrounds the shrine (as it should do), and its architectural design mimics that of ancient Greece – a metaphor for a people with which the ANZACs identified themselves during their time deployed in action. "Victoria’s largest war memorial and perhaps Melbourne’s most recognised landmark, the Shrine of Remembrance stands as a lasting tribute to our country’s fallen soldiers and various other servicemen who sacrificed their lives. " Visiting the Shrine of Remembrance can be a deeply moving experience, and one that which young children especially may not find particularly interesting or be able to fully understand – thus it is advisable to ensure they are on their best behaviour throughout. One of the nicest touches which visitors may want to aim to be there for is the daily ceremonial taking down of the flags at 5 pm. This is a solemn yet spine-tingling experience, one that can not be had anywhere else in the proximity of the Melbourne CBD, let alone the large majority of the rest of Australia. Those in need of a dose of culture can make the easy trip to the National Art Gallery of Victoria, located in the heart of the Melbourne CBD, for exactly what you need. As Australia’s oldest dedicated art gallery that opened way back in 1861, this pristine and beautiful testament to human creativity is one of the pride and joys of Melbourne that is filled with visually impressive art and fantastic exhibitions all-year-round. Its series of modern, light-filled galleries ensures every piece of artwork and sculpture is illuminated to their fullest effect, and the displays themselves are many and varied, ensuring there is something here for all fans of not only art but culture in general as well. "Its series of modern, light-filled galleries ensures every piece of artwork and sculpture is illuminated to their fullest effect, and the displays themselves are many and varied, ensuring there is something here for all fans of not only art but culture in general as well." The building of the gallery itself is slick and modern, appropriately reflective of the contents inside, with a stunning stained-glass ceiling adorning the top of its main room that adds an extra layer of artistry to what is already a very worthwhile Melbourne attraction. Regardless of when you visit, there is always something happening at the Gallery, plus most of the exhibitions are FREE so it makes for a great place on those days in Melbourne when the rain happens to be coming down. You’d be hard pressed to find an Australian who doesn’t have at least one fond sporting memory of an event that was held during their lifetime at the iconic Melbourne Cricket Ground (or MCG as it is more popularly known). Having been host to such amazing sporting events as the 1956 Olympic Games, the first ever cricket Test match, the 2006 Commonwealth Games, the 1992 World Cup and countless VFL and AFL Grand Finals, the MCG is a historic and permanent fixture in Australian sports (as well as the scene of numerous blockbuster music and celebrity performances). Melbourne has one of the proudest sporting cultures of any Australian city, and the MCG is a true reflection of that fact, being a venue that is huge but still manages to maintain a feeling of friendly intimacy. "Having been host to such amazing sporting events as the 1956 Olympic Games, the first ever cricket Test match, the 2006 Commonwealth Games, the 1992 World Cup and countless VFL and AFL Grand Finals, the MCG is a historic and permanent fixture in Australian sports. :"
Numerous tours are available that allow interested parties to go behind the scenes of the venue, sit in the coach’s box, visit the change rooms and media centres, and more for the quintessential MCG experience. The stadium also contains the National Sports Museum, a facility which includes some of the most priceless pieces of memorabilia in Aussie sporting history. The MCG isn’t only strictly for sporting nuts, however, the sheer degree of significance the stadium has for Australian culture will have an impact on the non-sports-fan as well. The venue also has multiple facilities inside that serve food and drinks including cafes, bars and restaurants for added convenience. Melbourne has a creative flare it embraces and this helps to differentiate it from any other Australian city. It is often referred to as the ‘cool city’ and the laneways and arcades are just one way that it displays its 'je ne sais quoi’. Getting lost in Melbourne is not such a bad thing when you have interesting street art to look at. In fact, it can even lead to new discoveries like your new favourite hole in the wall café, secret rooftop bar or quirky clothing or gift shop. "Melbourne has a creative flare it embraces and this differentiates itself from any other Australian city." Download a laneways and arcades map or join a walking tour and discover some of Melbourne’s hidden inner city secrets, striking architecture and art works. Among some of the most popular laneways for street art are Hosier Lane- just off Flinders Street near Federation Square with an ever changing murals and endless walls of creative arts and graffiti that can often change suddenly overnight. Other notable laneways for street art are Centre Place, AC/DC Lane and Croft Alley. For quirky cafes and bars head to Degraves Street for alfresco dining, tiny shops and boutiques that will make you feel that you are walking the streets of a European city. One of the best wildlife facilities in Australia is within easy reach of the majority of accommodation in the Melbourne CBD – Melbourne Zoo. Standing as a world-class facility, Melbourne Zoo is spread over a large distance so that the animals inside are provided with ample space in which to feel comfortable and move about and is divided up into various regions of animals reflecting their worldwide location. Visiting the Zoo offers an opportunity to get back in touch with the many wonders of nature while being located only 4km from the Melbourne city centre. "Visiting the Zoo offers an opportunity to get back in touch with the many wonders of nature while being located only 4km from the Melbourne city centre." Set within a comfortable and scenic botanic garden setting, the zoo provides a relaxing atmosphere with a variety of landscapes, from the Victorian-era formality of the main drive to the lush jungles of the Asian and African rainforest areas. 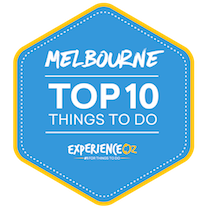 With numerous animals of all kinds to see, you will most likely need to dedicate a full day at Melbourne Zoo in order to see everything. Some of the most widely-acclaimed highlights of which include the elephant enclosure, meerkats, and of course many of the typical Aussie favourites such as kangaroos, koalas, echidnas and more. As the Zoo is extremely popular, the venue can often get quite crowded, especially on weekends and during school holidays (during which children can enter for free), so getting there early or choosing regular weekdays to visit is generally a good idea. The Queen Victoria Markets in Melbourne are the largest markets operating in the Southern Hemisphere with a 140 year history bringing fresh produce, merchandise and services to the people in the heart of the city. The markets officially opened in March 1878 after an interesting past as a cemetery and live stock market before its current status as a central marketplace. A wander around the heritage listed markets are a treat for the senses and a feast for the eyes as you see and smell all the delicious culinary treats on display to taste and purchase. Among some of the vendors that you can find here are fresh seafood from fishmongers, cheese shops, a delicatessen, organic produce, fresh fruit and vegetables, breads, cakes and pastries, ice cream and specialty products. There are also permanent cafes selling breakfast and lunch to all those who start feeling peckish walking around the markets. "A wander around the heritage listed markets are a treat for the senses and a feast for the eyes as you see and smell all the delicious culinary treats on display to taste and purchase." Visitors will find that this is a great place to pick up a gift or souvenir, whether it is for clothing, arts and crafts, UGG boots, leather items, children’s toys and clothing, jewellery, accessories plus health and beauty products. If you want to discover and meet the producers of some of the most popular markets then a 90 minute foodie tour is a great place to start to discover the marketplace. A tour such as this will lead you around the market with 10 food tastings and a complimentary glass of wine and a famous Melbourne hot jam doughnut. Tours run on Tuesday, Thursday and Saturday at 9am and 11am in small groups of no more than 15 people for a more intimate, personal experience. If you prefer to visit on your own then the markets are open on Tuesday, Thursday, Friday, Saturday and Sunday with the fresh produce section open at 6am and the specialty shopping open from 8am. The best way to get to the Queen Victoria Markets is via tram with the markets sitting in the free tram zone. Look out for Trams 19, 57, 58 and 59 which stop at Elizabeth Streets or Peel Streets just outside the markets. If you are looking for a romantic date night or a venue for a group celebration then the Melbourne Cruising Restaurant is a unique venue. Far beyond any restaurant, the Spirit of Melbourne cruising restaurant is your front row seat to discover the night lights of Melbourne while dining on a delicious 4 course gourmet meal. 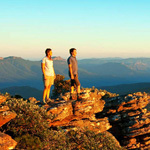 This is one epicurean journey that you should add to your own top 10 things to do in Melbourne. Cruise down the Yarra River taking in the sights and toast to the night with all premium red, white and sparkling wines, beer and basic spirits included in the evening. "Far beyond any restaurant, the Spirit of Melbourne cruising restaurant is your front row seat to discover the night lights of Melbourne while dining on a delicious 4 course gourmet meal." Come along with an empty stomach because you won’t want to pass up the food here on the four course menu. For entrée you can enjoy a Balsamic Glazed Smoked Lamb on mash potato, Shredded Chicken tossed through a sesame glass noodle salad and Prawn and Scallop Cocktail dressed in a creamy seafood sauce. For the main course you will have a choice of a Chargrilled Chicken Breast, Crispy Skinned Moroccan Salmon Fillet, Pan Fried Beef Eye Fillet or a Portuguese Lamb Shank. After your main meal, indulge your sweet and savoury taste buds with a dessert and cheese tasting platter. 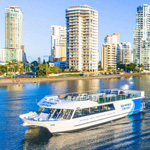 The Melbourne Cruising Restaurant operates on Thursday, Friday and Saturday evenings from 7.30pm to 10.30pm. SEA LIFE is Melbourne’s very own aquarium in the centre of the city with Southern Ocean and Antarctic animals on display. The Melbourne aquarium features 12 distinct, themed zones with over 10,000 marine creatures and continues to grow with a new exhibit opening in December 2018. Visitors to the aquarium can view numerous marine life including huge sharks, massive sawfish, stingrays, jellyfish, penguins, sea horses and a resident crocodile. "Sit in awe or stroll through the aquarium tunnels as you watch a diverse collection of animals in their exhibits, a spectacle that most people may have only seen in documentaries on television." See the Bay of Rays, Mangroves and Rockpools, the Coral Caves, Shipwreck Explorer, the Mermaid Garden, Ocean Discovery, the Croc Lair, the Rainforest Adventure, Seahorse Pier, the Penguin Playground and more. Sit in awe or stroll through the aquarium tunnels as you watch a diverse collection of animals in their exhibits, a spectacle that most people may have only seen in documentaries on television. A visit to the SEA LIFE Melbourne Aquarium is both entertaining and educational with informative daily talks and feeding presentations sharing information about the behaviours, habits and diets of the animals you are viewing. If you are looking for a half day activity to get out of the scorching hot sun or a rainy day activity then SEA LIFE Melbourne Aquarium fits the bill. A horse carriage ride around Melbourne is one of the more unique ways to discover all the highlights of the city. Not just reserved for royalty, you too can feel like a lord or lady sitting pretty up in these horse and carriages trotting around the city. In fact, a horse and carriage ride seems quite fitting when you see all the heritage buildings, churches, gardens and old government buildings of Melbourne. Choose between a 30 minute or 60 minute tour in your very own personal carriage seating up to 6 passengers. "A horse and carriage ride around Melbourne seems quite fitting when you see all the heritage buildings, churches, gardens and old government buildings that dot the city centre." Melbourne horse and carriage rides depart from Federation Square opposite Flinders Street Station from 1pm to 10pm. See the Yarra River, King Domain, The Shrine of Remembrance, Treasury Building, Parliament House, Princess Theatre, China Town and Collins Street. Tours operate from Thursday to Monday from 1pm to 10pm with the last 30 minute tours departing at 9.30pm. Book a horse and carriage ride during the day and see all the highlights of Melbourne by the day or join a horse and carriage ride at night for a more romantic experience with someone special. As with many other towers located in cities throughout the world, Melbourne's Eureka Skydeck 88 is a great starting point for a first-time visit by anyone to Melbourne that offers a quick way to get an idea of your bearings while taking in amazing views of the city and its surrounds from the vantage point of the 88th floor of Eureka Tower. As the highest viewing platform in the entire southern hemisphere, the distance viewable from the top of the tower encompasses not only a 360-degree panorama of Melbourne and its landmarks such as the MCG but also the picturesque ranges of the Blue Mountains that stretch out in the distance. "Eureka Skydeck 88 is a great starting point for a first-time visit by anyone to Melbourne that offers a quick way to get an idea of your bearings." Many who visit the tower often recommend attending in time to see the transition from sunset to nightfall, as the effect that the lighting has on the scenery of both the sky, the city and the mountains makes for a combination that is not to be missed. While the admission price may seem fairly expensive, there are no other options that provide comparably stunning views to what Eureka Skydeck has to offer visitors.